Osteomalacia is a medical term that means “soft bones.” The significance of this bone problem is that soft bones are likely to bow or bend and far more like to fracture than hard healthy bones. People over 50, especially those who are house-confined or receive very little direct sunlight on the skin, and experience hip and back pain should be aware of osteomalacia. Osteomalacia is softening of the bones due defective bone mineralization. This lack of minerals in the bone is due to inadequate amounts of available phosphorus and calcium, which can be secondary to lack of vitamin D or a problem with the body’s ability to break down and use this vitamin. Because osteomalacia is related vitamin D metabolism the entire skeletal system is affected. This results in a generalized bone softening due to inadequate mineralization of all the bones of the body. In osteomalacia, the fundamental problem is that the bone tends to break down faster than it can re-form. This results in bones that are soft and weak, and capable of breaking without much force or trauma. Osteomalacia is not the same as osteoporosis, which is another bone disorder that is also known to lead to bone fractures. Osteomalacia occurs because of a defect in the bone-building process due to inadequate calcium, while osteoporosis occurs due to weakening of previously healthy bone. Broadly speaking, bones are made up of protein that give them their shape and structure, and minerals that provide the hardness and strength. 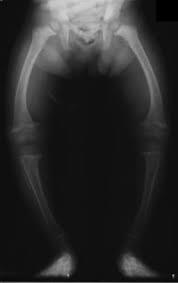 When a person has osteomalacia the bones have the normal amount of protein (collagen), but they lack adequate minerals (calcium) to strengthen them. Not enough vitamin D from food. Elderly who have a poor diet. People who do not receive adequate sunlight exposure. People who do not drink milk. Not enough exposure to sunlight, which produces vitamin D in the body. House-confined people or those who work long daylight hours indoors. Very little exposure to direct sunlight due to long sleeves and long pants. Shorter days of sunlight while living far north. Smog and air pollution blocking sunlight. Using very strong sunscreen or frequent applications of sunscreen. Inadequate absorption of vitamin D in the intestine. Massive calcium loss during heavy lactation. Inadequate absorption of vitamin D by the intestine. Disorders of vitamin D metabolism. Hyperparathyroidism that causes overly aggressive reabsorption of calcium from the bone. Kidney failure – causing phosphate loss. Lack of adequate phosphates in the diet. Drug side effects used to treat seizures. There are many causes of osteomalacia. 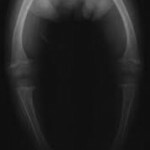 When it occurs in children it is called rickets and is usually due to inadequate levels dietary vitamin D.
The likelihood of developing osteomalacia is highest in those who have both inadequate dietary intake of vitamin D, and limited exposure to direct sunlight. For this reason the elderly with limited dietary intake and poor digestion, who are housebound or hospitalized, are at high risk to develop osteomalacia. Osteomalacia in adults begins with very slight and gradually developing symptoms of vague aches and pains in the hips and lower back, and sometimes thighs. Over time this pain insidiously spreads to the ribs and arms. Pain related to osteomalacia is usually symmetrical, meaning that it is felt equally on both sides of the body in a similar pattern. The pain is often accompanied by sensitivity to moderate pressure when applied to the involved bones. As the condition advances there is difficulty in climbing up stairs, getting up from a squatted position, and a classic “waddling gait” develops due to flattening of the hip bones. Bone fractures that occur without good cause or significant injury. Widespread or diffused muscle pain. Widespread bone pain, especially in the hips, that defies standard pain treatment. Involved bones will bow or become curved. Joints of involved bone that increase in size. Numbness of the arms and legs. Muscle spasms of hands or feet. Increased intake of foods high in vitamin D.
Foods fortified with vitamin D – cereal, bread, milk, yogurt. Oral digestive enzymes to improve absorption of calcium and phosphorus. Increase exposure to adequate sunlight on a daily basis. Wearing supports and braces to reduce, limit or prevent bone distortions and irregularities. Surgery to correct bone deformities, when severe especially for long weight bearing bones. With adequate and appropriate treatment to the cause of the calcium and vitamin D deficiency, some people will notice improvement of symptoms within a few weeks. Full correction of calcium replacement and complete strengthening of bones should result in complete bone healing and repair in approximately six months. Contact your family doctor if you have symptoms of widespread pain and muscles cramps, especially when it involves the hips and low back primarily, or if you suspect you have just injured a bone with a small injury. You might also contact your family doctor if you think you are at risk for osteomalacia. If you know your lifestyle prevents your from going out into the sun very long or very often, and you display some of the symptoms presented above, see your doctor. Just like treatment, prevention to be effective must be directed toward the underlying cause of the osteomalacia problem. For some people, eating a diet high in vitamin D foods (dairy of all kinds) and getting at least 30 minutes of sunlight exposure to a large part of the body. Sun exposure should not be confined to just the face or just the hands, but at least 20-25% of the body surface. This level of sun exposure can help prevent osteomalacia due to a vitamin D deficiency. For other people who have a problem with intestinal absorption, taking digestive enzymes or supplementing with calcium, vitamin D and phosphorus orally can also help prevent osteomalacia due to a vitamin D deficiency.